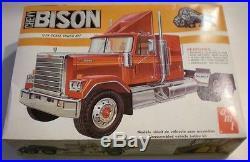 AMT Chevy Bison Plastic Model Truck Kit; Scale 1/25. Parts are factory sealed within inner bags. Decals are in good condition. Box is pushed in slightly on the left and back side of box. See pictures for a closer look. 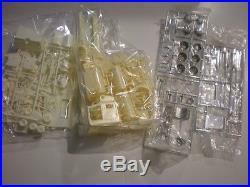 Molded in cream, yellow and chrome plated parts. 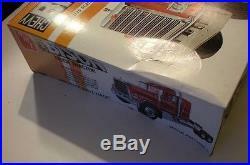 Features : authentic color decal trim, over 300 parts (many plated), 10 hollow vinyl truck tires, & dragfoiler air deflector. Rear axles/suspension: Rockwell SLHD/GMC Air, 34.000 # cap. Tilting Hood and fender assembly. Assembly Required; Glue and Paint Not Included. Check out our store Hobby Road for more models and accessories. These are not included in the item price. 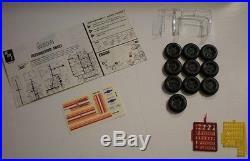 The item "AMT Lesney Chevy Bison Plastic Model Truck Kit Scale 1/25 #5002 Issued 1979" is in sale since Sunday, November 27, 2016. This item is in the category "Toys & Hobbies\Models & Kits\Automotive\Truck". 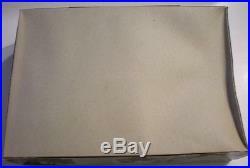 The seller is "hobbyroadusa" and is located in Muskego, Wisconsin. This item can be shipped to United States, all countries in Europe, Canada, Japan, Australia.